Two local farmers – one a wine producer, the other a distiller – are going out of their way to respect and protect the land. Black Fox Spirits is a farm-based distillery located just outside of Saskatoon. 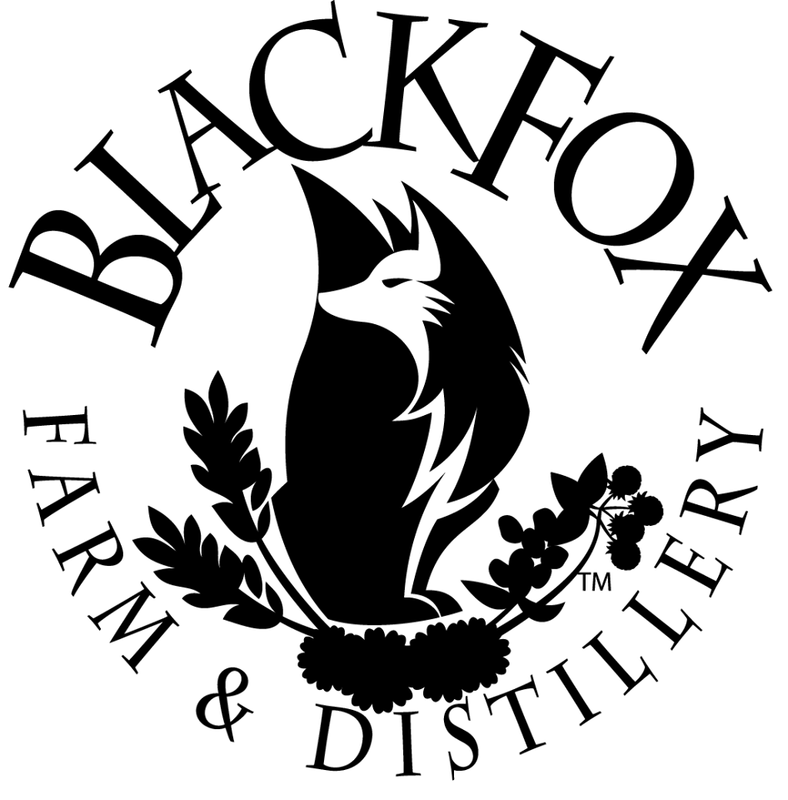 Its namesake is an unusually coloured black fox who spent one summer in and around their farmyard and was, like the distillery’s products, both local and unique. 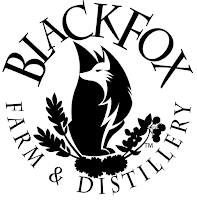 Black Fox Farm and Distillery grows 90% of its own grains, fruit, and botanicals. The only ingredients that are imported are some of the spices for gin (cardamom, orange peel). Leftovers after distillation are used as organic fertiliser for the farm’s fruits and botanicals. Food grade citric acid is used to clean the still by removing sulphur compounds. It’s then utilized in the fields to reduce the soil PH, a valuable way to increase productivity given their soil type. Grassy paths between the orchard rows and plots prevent soil erosion. Careful crop rotation reduces the need for pesticides. Four kilometers of newly planted shelter belts and 10 hectares of natural woodland reduce wind erosion and sequester carbon. 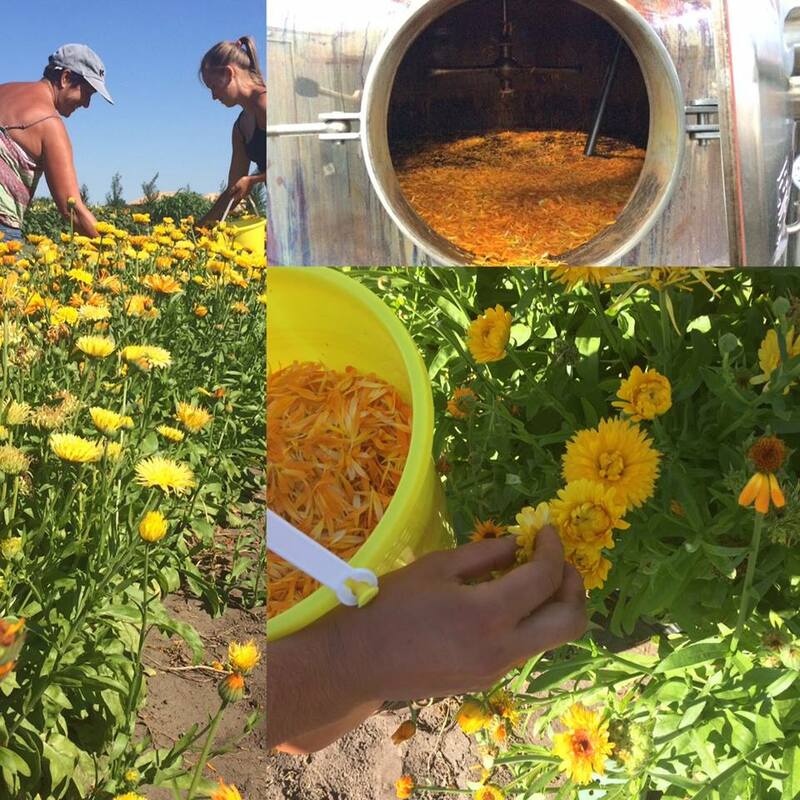 The farm’s bee hives provide the honey which is used to sweeten the liqueurs and make the brandy. The beeswax is used to seal leaky whiskey barrels. The farm’s beekeeper removes unwanted swarms for the City of Saskatoon. New colonies are quarantined and assessed for health before entering the main aviary. Insulation, a high-efficiency hydronic heating system, and energy-efficient steam boilers ensure that the building housing the distillery is as energy-efficient as possible within a limited budget. Electric vehicles are used as run-abouts on the farm. Alcohol by-products from the distillation process are mixed with gasoline and used as a bio-fuel for the farm machinery. The stored grain is conserved using natural aeration systems. Tasting glasses are reusable. Packing materials and pallets are reused or rebuilt. The grain fields aren’t irrigated. Zero tillage techniques increase water use efficiency and save energy. A buried drip irrigation system waters the fruits and botanicals. Recycled wood chips and compost are used as mulch to reduce weed growth and evaporation. The soils are monitored to ensure that the correct amount of water is used. Potable water is used to cool the condensers. The pre-heated water is later reused for making mash and for washing. The mash tanks are cooled using a geothermal system, circulating the water underground to use the earth as a natural heat sink. Retention ponds act as a natural buffer and filter between the agricultural land and the watershed. Sue Echlin and Vance Lester, the owners of Living Sky Winery, share a love of nature. Sue grew up on a ranch in Alberta, while Vance has a Master’s degree in ecology. 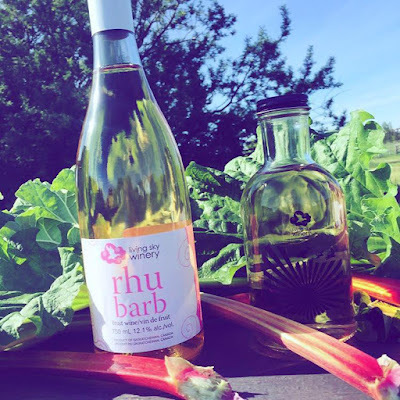 Sustainability is of the utmost importance on their farm and winery near Perdue. Living Sky Winery grows as many of its own ingredients as possible. They’ve started purchasing outside fruit to keep up with demand, but they’re staying as local as possible. The farm is pesticide-free and uses mechanical weed management. Rhubarb leaves are broken off in the orchard and left between the rows. Once they’re dry, they’re worked into the soil, serving as a very effective weed deterrent. All fruit waste, filter pads, and other organic materials are composted and returned to the orchard. The farm’s primary fertilizer is their own composted livestock manure. The 140 acres of land surrounding the orchard are planted with alfalfa for both nitrogen fixing and wildlife habitat, providing a home for a number of wild bee species. The hay isn’t cut until later in July to protect species that nest in the fields. 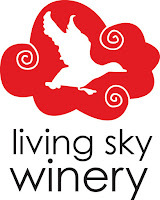 Living Sky turned the old Delisle Co-op into a winery. They saved as many of the building materials as they could while still creating a CFIA-approved facility. All plastic, cardboard, and other non-organic materials are recycled. Lightweight Eco bottles and Petainer cider kegs save energy by being lighter to transport. Aluminum bottle caps are recyclable. The owners plan to start installing solar panels next year and hope to eventually be as close to off-grid as possible. Three large ponds capture rainwater and run-off from the orchard and can be used in times of drought. The native plants around the ponds trap snow and provide wildlife habitat. The winery uses distilled water produced from the farm’s well. Waste water from the distilling process waters the fields. The owners are investigating ways to recycle the winery’s grey water. 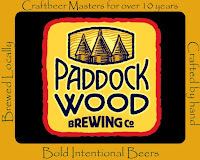 The spent grains and yeast from Paddock Wood Brewing Company are put to good use by local farmers as animal feed. 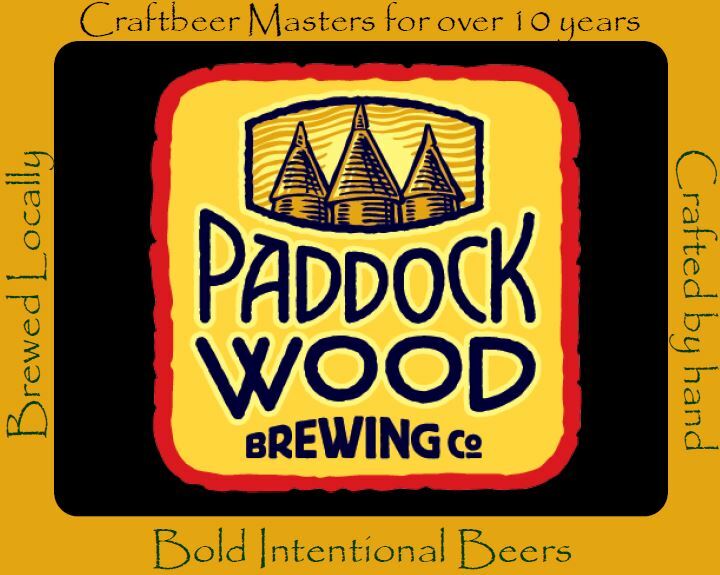 When funds become available, the brewery plans to invest in solar panels and more efficient bottle washing and labelling systems. They’re also looking into converting the spent grains into methane gas. Green Drinks is a get-together of like-minded people to discuss the environment. Green Drinks Saskatoon meets on the second Friday of every month. Green Drinks Regina also meets once a month.